We're a multi-generational group of singles, couples, families with kids, and retirees, from different walks of life. Some of our favourite things are cooking and eating, road bikes, gardening, coffee, mountain bikes, reading, commuter bikes, camping, hiking, music, craft beer and kids' bikes. Cargo bikes, sewing machines, tools and pets are also welcome. Rather than becoming too busy or frantic and feeling over-extended or isolated, we want a more practical and social lifestyle, based on co-operation, respect and caring for our neighbours. The young families in our group are excited to raise kids in cohousing, giving them room to be independent beyond their own backyard, as well as many opportunities to compromise with, learn from, and care about a wider circle of people. The older members appreciate the chance to downsize, while maintaining access to amenities like a garden and a workshop, and sheltering themselves from isolation in the long run. Takes a village - Across all ages and activities, we value each person's contribution of time, knowledge, enthusiasm and creativity to our village and local community. Do more with less - By rethinking the default approach to consumption, sharing resources and following the 3 R's (reduce; reuse; recycle), we act as stewards of our community and the wider environment, prioritizing interaction over materialism. Money matters - Respectful of our members' budgets, we make responsible financial decisions, aiming for the strong long-term performance of our investment. Working together - We trust each other to be responsible, to collaborate and to participate in the care and maintenance of our community. Embrace diversity - We celebrate similarities and differences in our welcoming community, built on honesty, open-mindedness and respect for privacy. Learning from each other - We use our individual strengths and our collective capacity to resolve conflicts in a respectful, collaborative and positive environment where people are not afraid to share their opinions. We are designing and building a sustainable cohousing project in a walkable, bikeable North Vancouver location. We are creating a diverse, inclusive, resilient community that balances privacy and a deeper connection with our neighbours, for a simpler life. Mackenzie and Steve are looking for closer connections with their neighbours through cohousing. Both originally from (different sides of the river in) Kamloops, they lived in Calgary and Halifax before coming home to BC in 2012. Besides wrangling children, Steve likes bikes and Mackenzie loves crushing a to-do list. Tyler and Carla moved to Vancouver from the BC Interior, and currently live in East Van with their two children and dog. They're enjoying having a yard with soil under their feet for the first time in ten years, and just being outside with their family. They hope that cohousing will create a strong sense of community and let their kids grow up knowing their neighbours. Lili and Marcus met in Halifax, Nova Scotia and bonded over their common Eastern European background and interest in traveling. Lili grew up in Albania, then lived in a communal and environmentally focused boarding school in Switzerland before moving to Halifax. Marcus grew up in Calgary with strong ties to the large Polish community before moving to Halifax to complete his residency in anesthesia. They moved to Vancouver in 2013 and currently rent in Kits. They love traveling, hiking, snowshoeing, skiing, watching a good movie and sharing meals with the company of their good friends and family. Cohousing speaks to their value of community. Dmitry and Tatiana came to Vancouver from Russia over 16 years ago, and enjoyed living downtown until their kids had to start school. When finding school didn't work out, they decided to relocate to the North Shore to appreciate the slower pace. As a family, they love spending time outdoors hiking, biking and swimming. Cohousing would add value to their life - having strong relationships with your neighbours makes people happier! Marta and Domenic are originally from Ontario, but North Vancouver has been home for the past 26 years. As a family, their love of hiking, running and biking has kept them close to the North Shore mountains. They want to downsize from their current home, as well as have the ability to walk and bike to local amenities. They are looking forward to building deeper connections within a diverse cohousing community that shares similar values. Domenic is a passionate wine blogger in his off-time; Marta, a life-long learner; their daughter, an avid geocacher. They are looking forward to this next chapter in their life. Wayne and Jennifer met when they were both working in southern Africa. They share a sense of adventure and a love of coffee! Now with two young adult children, they're looking forward to downsizing and joining new neighbours in a host of activities and friendly conversations. Tom retired from twenty-four years of living and working in Greater China in the areas of banking, finance and development work. His interests include Chinese history and language. He enjoys kayaking and being a happy granddad. Catherine came to Canada forty years ago from her homeland Taiwan. Thirty years after university, she went back to school and received her degree in Spiritual Care / Chaplaincy. She now enjoys working in social services. In her spare time, she loves working in the garden, surrounded by the beauty and bounty of nature. Last but not least, she is a happy Popo for four lovely grandkids. They both value close friendships and look forward to living in a cohousing community. Janet moved to Vancouver after a successful career as an artist / photographer and arts educator in the Toronto area. In a remarkable stroke of luck, she was invited to live at The ARC (Artist Resource Centre) among like-minded people - all engaged in various arts disciplines! Now fully acclimatized to a creative life in Vancouver, Janet is looking forward to cohousing. She will be enthusiastically photographing, singing, cooking, gardening, hiking and exploring with a caring community who share her vision of cooperation, adventure and intentional living. Carol is originally from the UK and loves all things design-related. She has lived and worked in countries as diverse as Malawi, Papua New Guinea, Scotland and Australia, and continues to love traveling in her summers off. Her daughter is at McGill in Montreal, but threatening to come back home when she graduates, which may coincide well with a move to cohousing. Carol believes that cohousing is the way of the future! For the past forty years, Mike, who hails from Australia, and Jane, from the UK, have lived on the North Shore. Jane enjoyed her career in Occupational Therapy and Mike in Computer (Mac) Technical Support; now they're playing the retirement game. Jane's pursuits are gardening, weaving, contemplative practice, and - on occasion - perfecting the art of doing absolutely nothing. Mike enjoys classical music, photography, tending the compost heap, and spending way too much time on the computer. They both enjoy walking and exploring local NS trails. They anticipate that many good things will happen as a result of downsizing their home and upsizing their community. Michele and Chris and their twin boys have been calling North Vancouver home for over five years. Michele is born and raised in the Lower Mainland, and Chris moved here from France twenty years ago. Michele is an Occupational Therapist, and Chris is an Osteopathic Practitioner with a private practice on the North Shore. Michele enjoys dancing, fine and performing arts, connecting with nature, nurturing friendships and creating community. Chris is happy when he's active outdoors, and enjoys kayaking, hiking and backcountry skiing. Their boys love running at the park, playing with Lego, reading, swimming and doing so many other fun kid things! Meghan and Matthew have enjoyed living in North Vancouver for the past ten years, and are looking forward to creating a supportive, sharing-minded community through cohousing. Originally from Vancouver Island and Saltspring Island respectively, Meghan and Matthew met in their last year of university at UBC and remained in the Vancouver area for work. They spend much of their time currently enjoying local parks and cycling routes with their delightful toddler, and look forward to when she is old enough to participate in kayaking expeditions. Andrea is from Milano; Natsuko from the beautiful Japanese island of Awaji. After meeting in the Sunshine Coast and some moving back and forth from Italy, they found a middle ground in North Vancouver, where they live with their two daughters. Living in a shoebox they miss the warmth and inclusiveness of a community, so they decided to try building one. They enjoy hiking, traveling, dreaming, good food and nice people. Maureen and Michael have lived in Windsong Cohousing since 1996. They have two adult daughters who live in Vancouver. Originally from Trinidad, Michael is the coordinator of a counselling program for the BC government. Maureen has taught English for many years in BC and Yukon; now she's writing a novel. They're excited about living in cohousing in a diverse, urban walkable neighbourhood! Patricia is originally from Uruguay, but has been in Vancouver for 40 years, where her two daughters were born. She has retired as a teacher, and enjoys being a grandma and being immersed in art, the outdoors, biking, music, dancing, gardening and watching a good film. Patricia loves people of all ages, especially kids, and looks forward to being part of the "village". She believes that living in community makes people happier and healthier. Let's be a role model for a better world! Originally from Edmonton and Calgary Alberta respectively, Brady and Andrea now live in their cozy little condo in North Vancouver with their pup Dallas. They came out 'temporarily' so Brady could pursue a Masters program at UBC ...and as was inevitable, they fell in love with the trails, the weather and the lifestyle! Four years later, they're putting down deeper roots. They are beyond excited to raise a family in a supportive community setting. No kids yet, but to bank up future babysitting hours, Andrea will use her baking skills and Brady will fix anything that's broken. In the meantime, you'll find them in their tent in the woods, flying down mountains, or chilling with a book at the beach. Rosie, Adam and Parker currently live in Vancouver, but are looking forward to calling North Vancouver home. Rosie grew up in North Vancouver and met Adam teaching English in Japan. Adam, originally from the US, has been living in Vancouver for seven years. Before sweet Parker was born, they spent their free time rock climbing, hiking and skiing. Now they spend all of their time chasing a toddler, but hope he'll be keen to join in their outdoor adventures as he grows up! They are excited for Parker to grow up in this community-oriented and environmentally conscious group. Dean and Allison moved to Vancouver from Australia four years ago and have been following the cohousing movement from afar for a long time. They are excited to be moving into a supportive community of friendly neighbours whom they can call their adopted extended family. 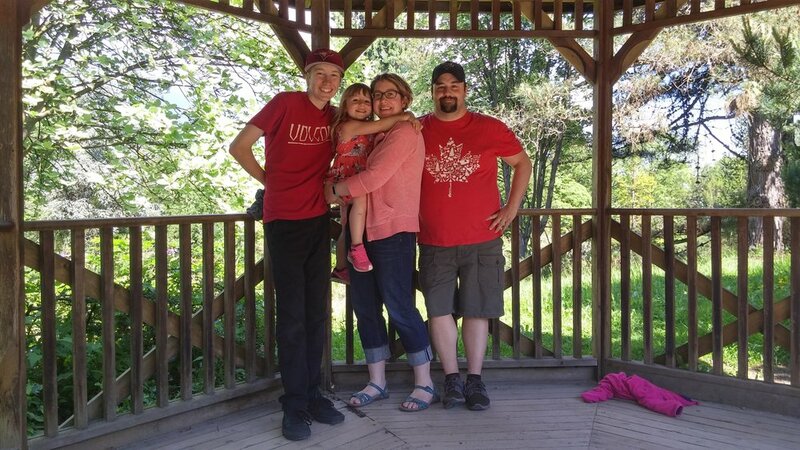 This family of five loves everything about the outdoor lifestyle in Vancouver: winter sports, hiking, camping, beach combing, biking, and just hanging out in the forest. Patrice was born in Akron, Ohio, and the story of how she moved from the US to Canada can best be told over a cup of coffee! She is retired from a career in the labour movement, where she worked with credit unions and co-operatives, as well as not-for-profits and the disability movement. Patrice now lives in Burnaby, but looks forward to returning to the North Shore. Her daughter Jordana lives in New Westminster, but spends many weekends and holidays at Mom’s. They are both looking forward to living in a caring, intentional community.